This river modelling course is intended for Delft3D Flexible Mesh (Delft3D FM), Delft3D 4 and SOBEK 2 users. Delft3D FM is the next generation simulation software package for evaluating and forecasting hydraulic functioning of rivers under normal, extreme and exceptional conditions, and the successor of Delft3D 4 and SOBEK 2. During this three-day course, we will address key functionalities such as: 2D river hydraulics, 1D river hydraulics, river induced flooding, river morphodynamics, and using Real-Time Control and Python scripting. This course focuses on hydraulic behaviour in rivers. Following a stretch of the Dutch river Waal, we will cover the basic functionalities required in consulting projects. You will learn how to set-up and work with a model in 2D Flexible Mesh for accurate computations and a 1D grid for fast computations. In this course we will introduce you to some of the similarities to both modelling approaches. We will address Real-Time Modelling of movable structures and give a brief introduction to the Python scripting functionality. 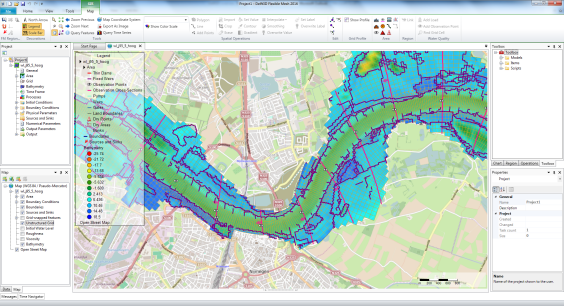 We will also show how to model dike overtopping with the new horizontal coupling of 1D and 2D models in Delft3D FM and give an outlook on future functionality regarding flooding studies. On the third day of this course, we will give an introduction to modeling of river morphodynamics and sediment transport with Delft3D Flexible Mesh (in 2D). At the end of this intensive course, you have made your own model and applied the advanced functionality of Delft3D FM, which you can use for future reference in your projects. Experience with river hydraulics and modelling is recommended.